Wow, just typing that title brought tears to my eyes...this is not going to be an easy one but then again nothing much really has been easy this past year. When I make that statement, it is not a negative one at all. Please try to imagine what it would be like to be taken abruptly from the lifeless vacuum that our boy was languishing in to the life that he has now, within the bosom of our family. You can only imagine what that would be like. If you are someone who has no concept of what it is to adopt a child from such a situation then you would think..."Hey, that kid hit the jackpot!" Believe me when I tell you, we have heard that statement or similar statements plenty of times. I guess that there is a kernel of truth in those words but it is so much more complex than that. The lifeless vacuum was all that Xiao Zhi Qing knew for over two years and even though it was not serving him well, it was what he knew. He did not know us, these strange, funny looking, strange smelling, weird sounding people that came in with their little girl (also adopted from China) to bring him home to become part of their forever family. That little girl that they brought with them only wanted to boss him around and then be very jealous of him all at the same time. Is it hitting the jackpot to lose your birth parents at 6 months old, to be born with two severe congenital heart defects, to live in two institutions and have several different caregivers in the course of 2 1/2 years, to be severely neglected for a long time and to end up leaving the country and culture of your birth without your consent, even if for your better good? I would say that Ethan did not hit the jackpot but I would also say in all modesty that his luck changed for the better on that difficult day one year ago. During those first very difficult days, I honestly have to say that I questioned whether I was equipped to parent a child with the kind of deficits and "autistic like" behaviors that "Ethan" demonstrated. I, along with Marc took it literally a moment at a time and my Mother, who was with us on the trip was smart enough and sweet enough to say nothing and just gently encourage me to keep going. I later found out that she was as afraid as I was, she did not want to scare me. She did not realize how scared I already was. We gingerly sidestepped any discussion that would address the fear that we both felt. When it was time to come home, Ethan was swept up into the loving arms of family and friends who not only wanted to have him be a part of them but to support all of his and our efforts to make him whole. He came home to begin the arduous tasks of teaching him to eat, walk steadily, regain his inborn reflexes, speak, run, jump and develop into a boy that would meet his potential. With us by his side, he has mastered most of those tasks and is presently gaining speed on his development and speech, with the help of an amazing public preschool program for speech and developmentally delayed children. 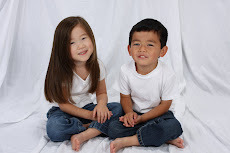 He has developed a strong sibling bond with Katie and a true love for his big brother Justin. He has developed a strong attachment to us over the course of the year. First to his Daddy who is his hero, and more recently to Mommy. I cannot tell you what his hard won devotion has meant. Most importantly, he has taught us the amazing gifts of patience, acceptance, hard work and unconditional love. There is no one in this world that can infuriate me and inspire me within a five minute space of time like he can. Ethan has maddening habits brought about by his tough start but I think that his most difficult qualities are the ones that helped him to survive his darkest days and still serve him well in his day to day life. Ethan is also hysterically funny and is as cute as the day is long. Believe me when I tell you that he uses those two qualities to charm all whom he meets. I want to take this opportunity to thank a few people who have helped us so much over the course of the past year. First to my husband who is my rock and is steadfast in his love and nurture of me and of our children. Thank you Mom and Dad, you have both been such a source of support to us and are devoted to the children. Dad, thank you for taking up the slack in the business while I tended to Ethan's therapies and while I commit myself to the raising of these children. I love you both so much. Thank you to my mother in law and father in law, Brenda and Al who will drop anything and everything to watch the children if we need them and are devoted to them as well. To Justin for also helping fill in the gaps when needed and for being such a loving and devoted big brother and to Judy, our future daughter in law, for taking on the new role of loving big sister in our family. You cannot even imagine how J and J light up the Dynamic Duo's life. To the DD's "Honorary Grandmother", Aunt Shirley who totally loves our children and to Marc's Uncle Howard who is devoted to them as well. To my sister, Jane who has huge soft spot for our mischief man and whose love and support I rely upon a great deal. Love you Missy Lil Sissy! To my friend Shannon and her loving family. Shannon and Al are Ethan's godparents and are devoted to him as well as Katie. We love you guys! To my friend Kira, who is Katie's godmother and has been there for me for the past 15years in every way possible. She is my biggest cheerleader other than my family. To my friends, Kim, Mary and Sherri who kept me off the ledge while I was in China. Of course that is not said literally. I was not ready to jump but they sure helped me keep my sanity during some very dark days. Thank you to my FCC South Florida Family and my blogging friends whom I love very much! Most of all, thank you Ethan for teaching me to be more than I ever knew that I could be. You have taught me lessons in life I never even knew that I needed to learn and you along with Katie and Justin have given me the greatest gift of all....to know the pure love of parenthood. Happy First Forever Day ~ Ethan Frederick Zhiqing! Ethan - Celebrating One Amazing Year with our family! I hate to complain but things have been a bit tough around here lately so I need to vent a bit. The DD were both sick about 10 days ago and passed it to me and Marc. I have not been able to shake it because Miss Katie is keeping us up at night. Katie and her 3 1/2 year old self, full of vivid imagination has decided that monsters have taken up residence in her room and they are just laying in wait for us to tuck her in to come out and play. She does not like them at all..."they scare me so much Mom!" We have tried all kind of things, brighter night lights, talking about imagination, spraying imaginary stuff from a spray bottle to keep them away, etc. We know it is just a stage and this too shall pass but boy oh boy, are we tired! Another thing that keeps me up at night is financial worries and mine and my father's real estate business. I know I am not alone in this as many of you are facing the same scary times as we are. Most importantly, what also keeps us up at night worrying, is that Marc's Dad is in the hospital. My father in law, Big Al, is a diabetic and has been an insulin dependent one for years. This heinous disease has robbed him of a good deal of his sight, has depleted his kidney function and has damaged his heart, in addition to a host of other maladies brought on by his diabetes. He has known for some time that he would have to have heart valve replacement surgery but was taking a wait and see approach, as he, as well as we, knew what repercussions such a surgery would have on his low functioning kidneys. Unfortunately, the time has come to face this head on as he was admitted to the hospital under emergency conditions last week and has now had a cardiac cathiterization to determine the extent of his heart issues. The bad news is that is has to have a bypass and valve replacement and now due to the iodine used during the cathiterization, his kidney function has worsened. It now seems Dialysis is in his future. The good news is that he has a wonderful surgeon and a very good attitude about everything. Please keep my wonderful father in law, Big Al in your thoughts and prayers. He is the best fil a girl could ask for. Too many things on our minds these days. We are looking hard for brighter days down the road. We know that they are coming but I wish they would hurry up and get here. As I told you in my previous post, Katie's new friend Shlomo stayed with us this past weekend. He was a pleasure to have as our guest. He did not require any special care or feeding and he was just happy to be in the crook of Katie Starr's arm most of the time. Here are he and Katie together last Friday. Shlomo is the Shabbat Teddy Bear at Katie's preschool. When a child is either an Abba" (Father) or "Ima" (Mother) for Shabbat service, then Shlomo is part of the honor that they receive. 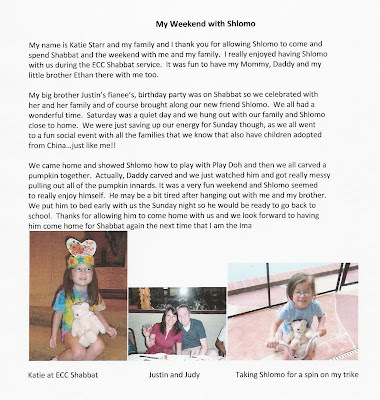 They get to bring him home for the whole weekend and then the parents write a short synopsis of the weekend with Shlomo in a notebook that is passed from student to student. It was fun to read what everybody else has written too. Here is a look at our page. You can click it to make it larger so that you can read it. Of course, I am going to post pics from all of the events that I mentioned. In the evening we went to Judy's 24th birthday celebration. These next 3 pics just crack me up. 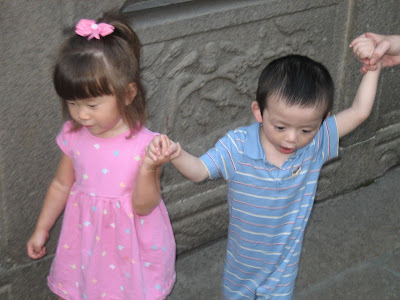 Ethan is totally the lady's man; whether it be with the older girls in our FCC group or here with Judy's friends. Marc, my Dad and I just laughed as we watched from behind. I kept wondering why they looked so interested in what he was saying. I mean I am sure it was meaningful but I am also sure that they could not understand most of what he was saying. For some reason they looked like they were hanging on every word. My dad speculated that he was asking what their sign was. On Sunday we had our annual FCC Halloween Event. It took Ethan all of about 2 seconds to get the concept of trick or treating down and he left with a pumpkin full of candy that was so heavy that I think I now have carpal tunnel syndrome after carrying it to the car. Let the trick or treating begin...check out Ethan's persistence in making sure he won the prize for obtaining the most candy possible in a single event. Yes, there is more candy here Mom! Do you want more sweets Rachel and Jaci Lu? Why of course! Dawn, you can gate crash any time my friend!! Then we went home and carved our pumpkin. Daddy carved and the DD helped...well half of the DD did as Ethan hated the pumpkins innards on his hands...must be that sensory issue..note to self to work on that. While Daddy was giving the pumpkin a face, Katie and Shlomo watched from her trike. I think that we showed shlomo a good time. We tucked him and the DD in early as they missed their nap and needed to rest up before heading back to school. As we begin each day with the DD, we are never quite sure what we will hear or see that will either leave us speechless or left laughing our asses off. This morning left us losing our asses once again. OK, next history lesson is about our mischief man...I have mentioned before that Ethan has the strangest fixation on his shoes and socks; especially his socks. He has a strong aversion to any sock that is not blue but most dark colors will suffice. White sends him into a tail spin on most days. Everyone who knows him knows this alarming fact about our sonny boy; even his teacher. You just do not mess with the boy's socks and to make matters worse if he is crabby, as he can be in the morning, well you just cannot go to that dark place. As we walked towards their room to wake them, I told Marc the news...it was "Sock it to Drugs Day" at the school. On this day you are supposed to wear mismatched, funny, crazy colors or whatever is kooky to show your support of the message "Just say no to drugs." I shuddered at the thought of messing in such a funky way with his socks. As we began to dress him, I pulled out some mismatched socks and just as quickly as I did that, he stuck his hand in the drawer and grabbed a blue pair. She wrote back to me "Yes, I understand!!!!" There has been so much bad news coming out of China in the area of consumer safety. Just to name a few of late, there was poisoned toothpaste, exploding grills, poisoned dog food, contaminated heparin, toxic toys but by far the worst scare to date in my humble opinion is the latest go round with Melamine contamination into the baby formula and dairy product supply. It has also spread to cookies and candies as well and has affected many other countries, most especially in Asia. The culprits (manufacturers) placed the toxic chemical into the food chain as a cost saving measure and it was easy to do as it replicates the protein content in milk. Melamine is used to make plastics and fertilizer. Health experts say ingesting melamine can lead to kidney stones and kidney failure, urinary tract ulcers, and eye and skin irritation. It also robs infants of much-needed nutrition. Down the road it can lead to cancer and sterility. Of course, these results are in lab animals as a human being would never be subjected to this chemical but the conclusions can sure be drawn that it would have the same results for humans and even more dire effects for innocent formula drinking babies. When I first got word of this scare in September, I was under the impression that it was isolated to the most recent past. Of course, I was very upset for the effected children. Then word began to get out about this going back into late 2005. That is when I started to be concerned about our children. Then, one of the large China Only Adoption Agency's directed it's clients who adopted back though early 2006 to speak to their pediatricians about what steps needed to be taken to discern whether those children had been compromised in the form of kidney stones by a chemical ingestion. I asked my pediatrician about what tests would need to be done to make sure our DD were indeed fine and kidney stone free. The Doctor tried to assuage my fears by reminding me that they had both urinalysis and blood work that would have found a problem if there was any. I felt relieved by that information, that is until my friend Kim, who is living in Shanghai with her three children sent me an urgent e-mail saying that the crisis there had deepened and that scope of the milk adulteration scandal in China widened, with four infants dead from contaminated baby formula and at least another 53,000 sickened. She said that China was paying to test children with Renal Ultrasounds so if that was the case, I needed to speak again to our Pediatrician and share this info with her. Now, anyone that knows Kim knows that she is no alarmist. In fact she had poo pooed the actions of many of her ex pat friends that were frantic in Shanghai just days before. Now, even she was concerned and that set me off once again. I sent an e-mail to our wonderful pediatrician who also used to treat Kim's kids when they lived in South Florida. I actually forwarded Kim's e-mail to her and she e-mailed me back with the answer that Kim obviously was in the know and that was enough for her to order the Renal Ultrasounds. Well, yesterday was the big day; the day that the DD would have their sonograms. I told them what to expect so that they would not freak out. When we entered the room to administer the US, the technician asked the children who wanted to go first. Of course, Katie said Ethan and Ethan said Katie. I tried to lift Ethan up and quickly realized by Ethan's demeanor that Katie should go first. Thankfully, Mommy's instincts were right on as Katie did really well and enjoyed watching the picture on the screen. She chatted away about this, that and the other and had the tech in hysterics. Of course, the promise of a lollipop was also quite helpful in reminding her to stay still. Then, it was Ethan's turn and he was still a bit reticent. Katie was an awesome big sister (by 2 and a half months mind you) and told her brother that it would all be OK and it just tickled....it did not hurt! She stood there by his side and kept her hand on his leg while she comforted him. It did not take long before Ethan decided it tickled too and was cracking up. Then it was our job to keep him from laughing too hard :) Thankfully, we were able to get lots of good views for the doctor to read. The end result is that we got the all clear today. They are stone free...thank goodness! I felt in my heart that this would be the end result but without our children's health history and with really no prior information to speak of we felt it better to be safe than sorry. I know that this is not every adoptive families take on how to handle it but it was ours and we feel good about it. What I feel bad about is that there are so many children suffering in China and around the world because of this. I also am sick about the fact that China has not tightened it's safety standards and that there is evidence that they covered-up and prevented news of the tainted formula from being made public for a month or more during which the Olympic games were held. Was it ignorance of the gravity of the situation or was it a more serious omission of the damning evidence? In China, is it the political or psychological structure of the culture and government that is completely out of step with the rest of the world? Whatever the answer to that question is there is one thing that I know for sure, sorry is not enough! There there are too many people in China and around the world at risk due to all of their exports. The welfare of people always need to come before profit and so there must be REAL change in the Peoples Republic of China. The Dynamic Duo Keeps us Hopping! The DD keep us very busy each weekend. Our life is much different than when the only child that we had was away at college and our only decisions were whether we would sleep in on the weekends before a day of activities and then a night out with friends or leave town for a quick weekend get away. Now, there are play dates, family events, FCC events and of course birthday parties. This past weekend was no different and as I look at the calendar to the weeks ahead it is really quite overwhelming. Probably more overwhelming for Marc than for me. I am the ultimate social animal and even though my dear husband is a Disc Jockey by profession, after his social events end he wants nothing more than to chill at home. He is definitely a very accommodating dh as he always goes to each party as well and does more than his share. I am not going to claim that I do not miss those carefree days but the trade off to this life is much more rewarding in the long run...exhausting but rewarding ;0) Besides, we have made some of the most special friends through our adoptions. This past weekend we had a birthday party for my cousin's one year old daughter and then we were off to a Pumpkin Patch for our FCC Halloween Photo Shoot. The previous day we had spent some time at the patch scouting it out for the group. When it's all said and done, we really love living our lives while enjoying the perspective of our two three year olds. We always joke that we are not sure if it is making us younger or killing us. The jury is still out on that one. These first few photos are of the DD having fun in the pumpkin patch the day before the photo shoot. The next morning was cousin Romy's birthday party and as you can see the kiddos enjoyed the cake. This was the cake that Romy was supposed to eat with her hands but she didn't care for that too much. The three videos that I have posted are too cute. The first is us trying to get photos of the children. It was like the "red couch" photos onb steroids. Katie started to cry and Marc put her next to Mia which helped ALOT! In the second video check out when Katie kisses Mia and then in the third video they are talking and giggling together...so cute...enjoy!